AGI reported that around 15 CSKA fans had been hurt, two of them seriously. Rescuers evacuate a person who was wounded after the escalator incident. 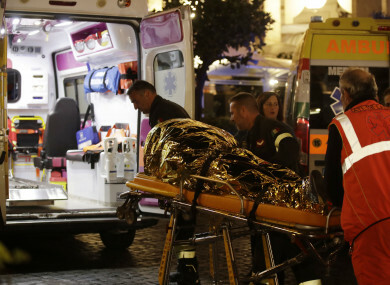 AROUND 20 PEOPLE were injured Tuesday when an escalator leading to a metro station in central Rome collapsed in an accident believed to have been caused by Russian football fans, Italian media said. The AGI news agency said that “a large group of CSKA fans, probably under the influence of alcohol, began to jump together, provoking the collapse” of one part of the escalator. Sky-TG24 television quoted police sources as saying that at least 20 people had been injured, mostly Russians, and that one was in serious condition. Email “Around 20 injured in escalator incident ahead of Champions League clash”. Feedback on “Around 20 injured in escalator incident ahead of Champions League clash”.